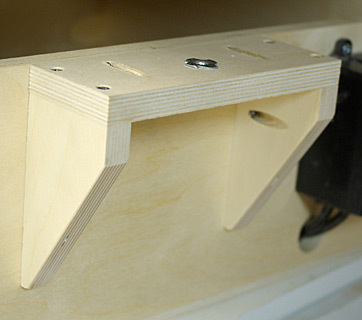 This should look familiar, but if you didn't make the height adjuster bracket back at the cabinet assembly now is the time. On my original version I used 5/16" threaded rod, and noted back then it wasn't ideal. What would be best is an acme threaded rod, but I can't find any acorn nuts with an acme thread, and didn't want to try grinding a curve or point on the rod. It works well enough with a regular thread once we go through some contortions. A larger diameter rod couldn't hurt, but 5/16ths is convenient. A t-nut alone is terrible for this application, way too much play. Under the t-nut goes two layers of 3/4" ply. The top layer is sort of a lock, but it doesn't really prevent you from being able to turn it, just to keep it from spinning on its own accord. I had no lock on my original version and over three years it only spun by itself a handful of times, but it's annoying when it happens. So this is more of a friction-adjuster than a lock. 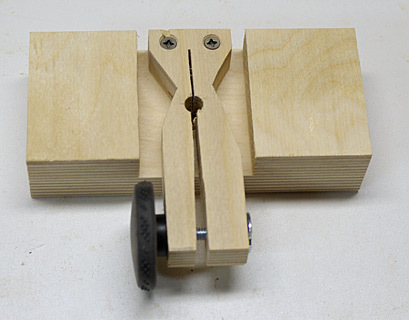 On the t-nut for the lock knob I bent all but one of the points flat in a vise so it wouldn't split the plywood. The bottom layer has another of the bushings that were used for the table pivot. This assembly gets screwed to the support plate. The full assembly. At the top of the rod is an acorn nut tightened against a nut, and the bottom wheel has a t-nut in it tightened against a nut. 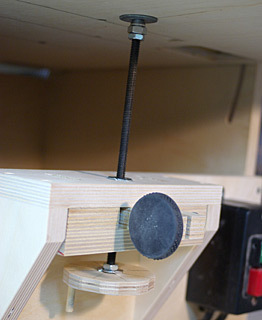 The acorn nut pushes against a fender washer, which is just loose between the nut and table. With the weight of the table it's not going anywhere.